As every truck operator knows, tyres are one of the big three recurrent costs of running a trucking business, along with staff and fuel. Tyres also account for about a third of a truck’s fuel use, to overcome the rolling resistance. So, how about trying to directly reduce that drag on costs? "Without doubt, low rolling resistance tyres represent the most important development for the industry in having the potential to significantly reduce the overall cost for fleets," Claudio Sodano, Group Manager, Technical Field Service, for Bridgestone Australia, says. Sodano says the fuel cost for a typical line-haul fleet fuel works out to around 10 times the amount spent on tyres, with fuel accounting for up to 30 percent of the total fleet cost. And in a typical line-haul application, tyre rolling resistance accounts for about one third of that total fuel usage, Sodano tells ATN. "So the bottom line is that approximately 10 percent of the total fleet cost can be attributed to tyre rolling resistance," Sodano says. "You start to drop that number, and you make a real difference to the bottom line." Sodano advises operators to "watch this space" for a major development from the Japanese giant: "We are seeing some very exciting results in testing of the latest iteration of Bridgestone’s LRR heavy vehicle technology." The message from French tyre titan Michelin on the benefits of LRR tyres is similar. "The Michelin ‘Energy’ range can save at least 4 percent of fuel consumption, and I insist on ‘at least’, because we want to be conservative," Bertrand Dalle, Commercial Director for Trucks, Michelin Australia, says. "But we have seen through tests and feedback from different customers that you can get far above that figure," Dalle tells ATN. Dalle concedes the tyre industry has struggled to find a balance between lower rolling resistance and more rapid wear. "But if you use Energy tyres on a long-haul application, say on the highway between Sydney and Melbourne, there is no trade-off," he says. 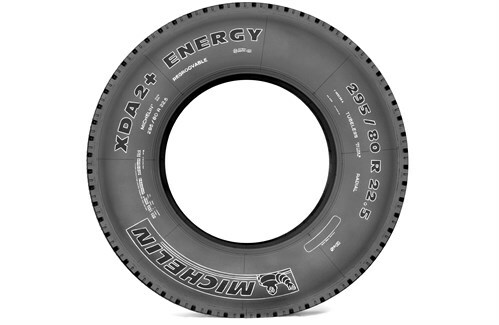 Energy tyres come with a roughly 10 percent price premium. Michelin says there has also been a "steady increase" in the use of low profile truck tyres in Australia, which also use less fuel and give added stability. "We have seen in the past two years some operators switching to those sizes on their trailers," Dalle says. Big south eastern Australia operator Ron Finemore Transport runs low profile tyres. The company also uses nitrogen to inflate its tyres. Nitrogen-filled tyres run cooler. Nitrogen is a larger molecule than the gases in air, so less leaks out through the rubber, and therefore tyres also hold their pressure better. Dalle says nitrogen "can’t hurt" but warns: "There is a risk that people stop doing their preventive pressure checks." Managing tyre costs involves lots of common sense strategies such as vehicle alignment and fleet tyre tracking. Simply buying the cheapest tyres is not one of these strategies. "Consideration of the total life cost of a tyre is key," Bridgestone’s Sodano says. "For example, using a premium tyre for its first life, and then backing up with a premium retread for a second or even third life for the casing, will be unbeatable in terms of cost per km, and is a much more compelling argument than just buying the cheapest tyre to start with." David Coonan, National Manager, Policy, for the Australian Trucking Association, agrees: "A very smart operator will work with a tyre application engineer and buy the right tyre for their application." Coonan says tyre dealers have an interest in providing good service, and can generally be trusted. "You can always get a second opinion," he adds. "A good responsible tyre service can be very cost-effective for an operator, rather than them trying to do it themselves." "Tyre technology is improving all the time," says Coonan, who has a heavy vehicle technical background. "There’s no doubt that a modern tyre is safer than even a five-year-old tyre." Even the most modern of tyres needs to be properly maintained, not only to be safe, but to save money. 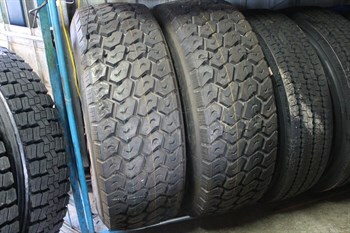 "Regular tyre inspections are simple to do but easily forgotten in the day-to-day running of a business," Sodano says. "However, doing it right — that is, keeping an eye on pressures, tread depth, irregular wear, damage and regular rotation — can save big dollars. "Evaluation we have undertaken has shown that you can increase the life of a steer tyre by as much as 30 percent just by regularly rotating tyres. Given the margins many operators are running at, that translates into real savings. "We also find that some operators don’t understand the importance of getting dual tyre assemblies right. It’s critical to ensure the tyres aren’t mismatched in terms of overall diameter. "Our tests have shown that if you match a new tyre with a tyre that’s 50 percent worn, you can dramatically reduce the life of that new tyre, by as much as 40 percent." Maintaining correct tyre pressure is imperative in achieving maximum tread wear, maximum fuel efficiency, good road handling, the integrity of casings and preventing blowouts. Kicking a tyre or hitting it with a steel bar only reveals if it is doughy or completely flat — the experts recommend investing in a tyre gauge. And a weekly check is far better than over-inflating "just in case". There are technologies which can take some of the labour out of tyre pressure maintenance. 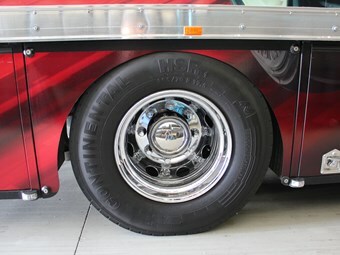 One of them can be seen on trailer wheels of the big east coast operator Lindsay Australia — the "Crossfire 100 psi". This gismo connects to the valves on a set of duals and equalises pressures as well as enabling a visual pressure check. More advanced systems — for example those produced by axle specialists Meritor, Hendrickson and Spicer — not only monitor pressures but use chassis system air to automatically inflate tyres while the truck is driving along. Some systems can monitor tyre temperature, warning the driver of an impending blowout. Even better than automatically maintaining pressure via a mechanical system is having tyres inflate themselves. American tyre company Goodyear is trialling self-inflating tyres in commercial vehicles and hopes to have them available in Australia soon. A thin tube runs around the inside of the tyre, and is connected to a valve open to the outside air which sits below the tread. Air is let in or out of the valve and tube depending on the tyre pressure, which is monitored by internal sensors. "Tyre-related costs are the single largest maintenance item for commercial vehicle fleet operators, with more than 50 percent of all truck and trailer breakdowns involving a tyre in some way," a Goodyear press release announcing the trial last year says. "Goodyear’s Air Maintenance Technology mechanism allows tyres to maintain constant, optimum pressure without the use of external pumps, electronics and driver intervention. 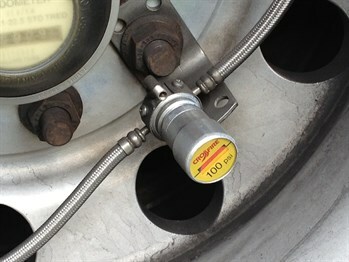 "Optimum tyre pressure is key in the commercial market. It is estimated that for every 10 psi(70kPa) lost in tyre inflation, there is a 1 percent loss in km per litre." Goodyear also estimates that tyres which are under-inflated by just 10 percent decrease tread life by 9-16 percent. Do you have any tips for taking care of your truck tyres? let us know in the comments.